You may submit Google Voice messages to Quicktate on an as-needed basis, or you may choose to have all of your Google Voice messages transcribed by Quicktate. If you wish to submit selective Google Voice messages to Quicktate on an as-needed basis, just forward the email message you received from Google Voice to transcribe@quicktate.com. [Be sure to send them from the email account you signed up with, or subsequently registered with Quicktate]. 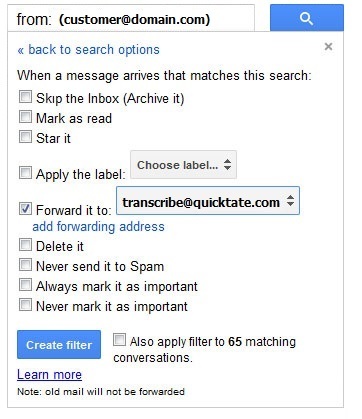 Alternatively, if you choose to have all of your Google Voice messages transcribed by Quicktate, set up filtered email forwarding from Gmail as described below. In all cases you will continue to receive your Google Voice messages and your Google transcription just as you do now. You will see: " A confirmation code Has been sent to verify permission ". You will see a link that says “ Tip: You can also forward only some of your mail by creating a filter! ”. Click " creating a filter! ". This will bring up a filter menu where you can create a filter so that only mail from Google Voice gets forwarded to Quicktate. Check the box that says "Forward it to transcribe@quicktate.com". Click the "Create filter" button. At the top of Gmail, you will see: "Your filters are forwarding some of your email to transcribe@quicktate.com. This notice will end in 7 days." This is normal. Google will send your voice mail message and Google transcript to you by email. Gmail will automatically send a copy of your message to Quicktate. Quicktate will confirm receipt. Quicktate will re-transcribe your message and email it to you along with a link to your audio. Please note that old emails from Google Voice, (messages that you have already received), will not be forwarded to Quicktate. If you want those sent to Quicktate, you’ll have to forward them manually. If ever you do not want to automatically forward your Google Voice messages to Quicktate, go back to Settings > Forwarding and POP/IMAP, and click on transcribe@quicktate.com and in the drop-down box, select “Remove transcribe@quicktate.com”. You will still be able to forward your messages on an as-needed basis.